IT IS FASHIONABLE to say that the individual is unique. Each is the product of his or her own heredity and environment and, therefore, is different from everyone else. From a practical standpoint, however, the doctrine of uniqueness is not useful without an exhaustive case study of every person to be educated or counseled or understood. Yet we cannot safely assume that other people’s minds work on the same principles as our own. All too often, others with whom we come in contact do not reason as we reason, or do not value the things we value, or are not interested in what interests us. The merit of [type theory] is that it enables us to expect specific personality differences in particular people and to cope with the people and the differences in a constructive way. Briefly, the theory is that much seemingly chance variation in human behavior is not due to chance; it is in fact the logical result of a few basic, observable differences in mental functioning. Myers, Isabel Briggs; Myers, Peter B. (1995-05-03). Gifts Differing: Understanding Personality Type. Nicholas Brealey Publishing. Kindle Edition. Since 1921 more than 50 million people, 10,000 companies, 2,500 colleges and universities and 200 government agencies have applied type theory in team building, organizational development, business management, education, training, and career counseling to increase individual and organizational effectiveness. And while type theory has its distractors, most criticisms relate not to the theory itself but to the Myers Briggs Type Indicator (MBTI)—a 93 forced-choice “psychological assessment”—and how it is administered in large organizations. Our response is don’t throw out the baby with the bath water! Dispense with the MBTI if you wish, but keep Jung’s type theory. According to type theory, there are four core components of personality, which we call orientation, perception, judgment and attitude. Orientation refers to our relative interest in the inner world of ideas and feelings versus the outer world of people and things. Our orientation determines where we focus our attention. Type theory refers to inwardly focused people as introverts and outwardly focused people as extroverts. We call introverts turtles and extroverts puppies. When circumstances permit, turtles focus their attention on ideas and feelings inside their head, while puppies prefer to focus on the outside environment. Turtles view the world from the inside out while puppies view the world from the outside in. Well-developed turtles deal competently with the outer world and are often sociable and friendly, but they do their best work inside their heads. Similarly, well-developed puppies are able to deal effectively with internal ideas and feelings, but they do their best work and most enjoy interacting with others. Jung observed that we are all born with two means of perception—sensing and intuition. Sensing is how we become aware of things directly through sight, sound, touch, smell, and taste. Intuition involves perceptions from the subconscious mind that do not draw from the five senses. Intuitive perceptions come in the form of hunches and gut feelings. The two means of perception compete for our attention and most of us from infancy up come to enjoy one more than the other. Think of it like being right-handed or left-handed. Most of us prefer to use one hand over the other. It’s not that we don’t have a left hand, for example, but we simply prefer to use our right hand for writing and throwing. The more we use our right hand, the more coordinated it becomes. The left hand does just enough to get by unless it becomes important to develop it further. We enjoy doing what we are good at and we do (and get better at) what we enjoy. Those who prefer sensing are interested in facts and may have little care for ideas coming from their unconscious mind. Those who favor intuition prefer to imagine possibilities rather than focus on facts. Type theory calls this the SN preference: S for sensing and N for intuition. We call the sensing types eagle eyes and the intuitive types psychics. As with perception, Jung observed that we are all born with two means of reaching conclusions about what we perceive—feeling and thinking. Feeling is subjective and thinking is objective. When making a feeling judgment, we decide based on what exists in our minds, what we like or don’t like, what we find pleasing or displeasing, what we believe is agreeable or disagreeable. Envision feeling judgment as a set of balancing scales—one thing is always weighed and balanced against another. When making a thinking judgment, we decide based on a logical process aimed at reaching an impersonal objective finding. Envision thinking judgment as a calculator deducing that if a = b and b = c, a must equal c.
Viewed from the perspective of the judger, both means of judging are rational. However, viewed from the perspective of others, thinking judgments may be regarded as flawed and feeling judgments may be seen as arbitrary and impulsive. No one can convince us that we do not know what we like and dislike, but often it can be objectively shown that our logical conclusions are wrong. Those who prefer feeling tend to become more skilled in the handling of human relationships while those who prefer thinking tend to become more skilled in the organization of facts and ideas. Type theory calls this the TF preference: T for thinking and F for feeling. We call the thinking types pointy heads and the feeling types bleeding hearts. The TF preference is the only personality preference with a clear gender bias. Approximately, 70 percent of women and 40 percent of men in the U.S. are bleeding hearts. Approximately, 30 percent of women and 60 percent of men are pointy heads. We all must exercise both perception and judgment but we cannot use both at the same time. When we are in perception mode, we are gathering information before coming to a conclusion. Eventually, we must stop perceiving and apply our judgment in order to reach a conclusion and act. According to type theory, early in life we develop a preference for having a perceiving attitude or a judging attitude toward the world around us. This preference marks the difference between judging types that prefer making decisions to collecting information and perceiving types that prefer collecting information to making decisions. Type theory calls this the JP preference: J for judging and P for perceiving. We call the judging types tyrants and perceiving types hippies. Tyrants slightly outnumber hippies in both sexes. The combination of the orientation, perception, judgment, and attitude preferences produces 16 distinct personality types as shown in the table below. Few of us fit neatly into any one of the 16 types. Most people exhibit characteristics of three or four different types. This is not an indictment of type theory. Most people also see little of themselves in the other three-quarters of the 16 different types. The so-called Five Factor test provides greater precision but at the cost of complexity that makes it ill-suited for individuals and businesses. We believe that in the journey to better understand ourselves and others, the perfect should not become the enemy of the good. 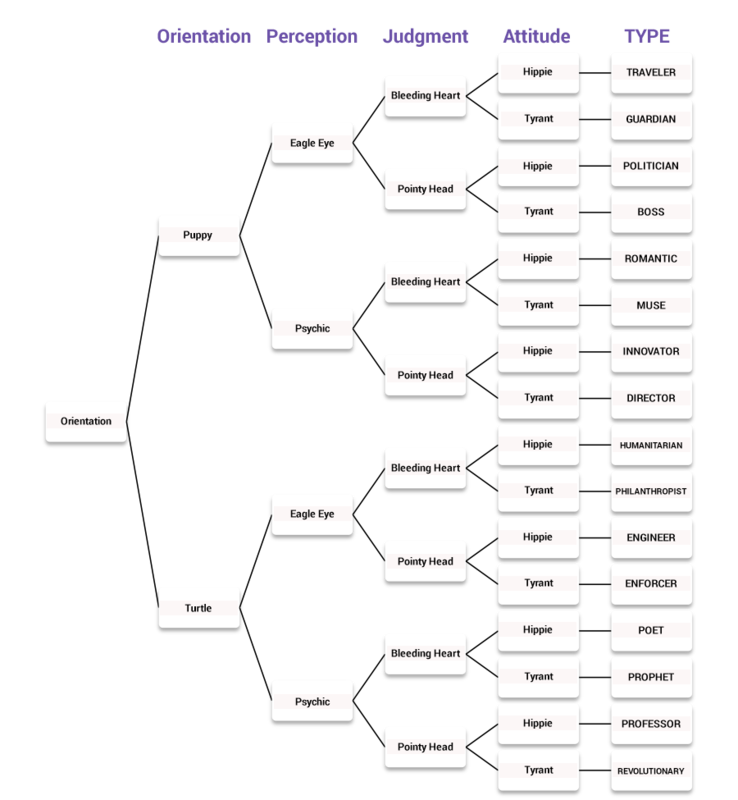 The following table lists the 16 personality types and the translation between type theory and 2bme. You may have noticed that the order of the perception and judgment preferences is different in the descriptions above. For example, the Boss is a pointy-headed, eagle-eyed tyrant puppy; whereas, the Enforcer (the introverted version of the Boss) is an eagle-eyed, pointy-headed tyrant turtle. The reason for reversing the order of the eagle eye and pointy head preferences is to put the type’s dominant psychological function first. According to type theory, a person’s dominant function will be more well developed than his or her secondary function. The preference for introversion or extroversion combined with the preference for judging or perceiving determines a person’s dominant function, either perception of judgment. In other words, we all take in information (perceiving) and make decisions (judging), but most of us are better at one or the other. 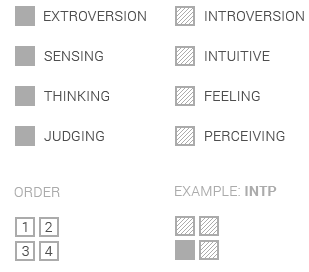 The various combinations are shown in the following table. Puppies use their dominant function to interact with the world around them. They use their secondary function when focusing on their inner world, for example, when they are alone or when the situation relates more personally to them. Turtles use their dominant function in their inner world. This explains why you must get to know turtles before you can appeciate their greatest strengths. Turtles use their secondary function when dealing with the outer world, which places them at a disadvantage to puppies in this setting. Think of the dominant function as the CEO and the secondary function as the CEO’s executive assistant. When you are dealing with a puppy, the CEO greets you at the door. You get to deal with the person in charge right away, while the executive assistant waits in another room to help if needed. When you are dealing with a turtle, you are met by the executive assistant outside the CEO’s office. You don’t get to meet with the CEO unless you first convince the assistant that the matter is important. To put this into context, consider the Traveler and the Professor. The Traveler’s CEO who greets you at the door is eagle-eyed perception. The executive assistant waiting outside available to help only as needed is bleeding-hearted judgment. When dealing with a Professor, you will be greeted by the executive assistant, psychic perception. The CEO, who is probably to busy to see you unless you are a valued colleague, is pointy-headed thinking. According to type theory, we all have four psychological functions—two variations of perception and two variations of judgment—with descending levels of dominance in our personality. As described above, our dominant function is the CEO and our secondary function is the executive assistant. But we also have a tertiary function and a quaternary function. Our tertiary function is the alternate variation of our secondary function. Our quaternary function is the alternate variation of our dominant function. So for example, the Professor’s tertiary function is eagle-eyed perception, and the Professor’s quaternary function is bleeding-hearted judgment. The development of our four psychological functions takes place over time as we mature. The development timeline is different for each individual but there are broad general patterns. At about age six our dominant function starts to become pronounced. Then at about age 12 our secondary function begins to strengthen and become more apparent. Once the dominant and secondary functions are fully in place by about age 25, we have a trusted and reliable system of taking in information and making decisions. As we approach age 40 many people experience increased development and reliance on their tertiary function. Coincidentally, or not, this is also the time many people experience a mid-life crisis—a realization that life is not eternal, and there is little excitement in experiencing the rest of life exactly as we experienced it to this point. Later in life, many people begin to develop their weakest function, the quaternary. For some, development of the tertiary and quaternary functions results in a career change. Others may adopt new hobbies or pastimes. Psychologist David Keirsey observed that four combinations of type preferences correspond closely with the four temperaments of human nature described throughout history. The four combinations are eagle-eyed tyrants (SJs), eagle-eyed hippies (SPs), pointy-headed psychics (NTs), and bleeding-hearted psychics (NFs). The following table describes the differentiating characteristics of the four temperaments and shows the correlations between type theory and historical labels used to describe these major variations in human nature. Because 16 distinct personality types can be overwhelming, especially at first, it’s often easier to see yourself and others more broadly as falling within one of the four temperaments. From there one can then zero in on individual personality types within the same temperament.